In this long-awaited second book of poetry, Robert Prochaska gives voice to a radical new poetic paradigm. A major advance in form and substance, The Horse Portraits is a stark journey beyond metaphor giving voice to the deepest magma of the human experience. In the process, he shaves away the sharp, hardened edges of existence to reveal the true beauty and incongruity of the world. Prochaska’s idealized notions of masculinity, failed aspirations, success and loss, the somber episodes of man taking on the world are transformed in these poems into riveting perspectives. Walking the narrow, cobblestone streets of Prague, iconic portraits spring up of his ancestral past from every corner of the city representing dreams that have come alive. Yet the true power of The Horse Portraits lies in Prochaska’s unflinching challenge to death and decay, his battered psyche pitted against hope and the attempt to gather the shattered elements of faith in a shifting world of troubling uncertainty. In the end, Prochaska renders beautifully executed poetry that ultimately becomes a courageous dance with existentiality itself, exposing both his own and the world’s soul in all their compelling nakedness. Robert Prochaska explains the source of his book’s title in an introductory note as “two drawings, those of horses’ heads in my parents’ dining room,” which “heightened my hope that the people who bought them wanted to be like them, running free in an open field.” As his work on the book developed, a trip to Prague prompted more poems with perspectives on his family’s history. The result is a book in two parts, the second of which is enhanced by the sense of place the old and mysterious Czech city inspires. in their original frames, facing each other. his son crying by the flames, fire truck, and sheriff. The dangers in writing about family and childhood include that of falling into sentimentality, and here Prochaska steers a wise course in building on specific objects, starting with “Dresser,” which contains a box of matchsticks, a pair of cuff links, and a pack of playing cards that become vehicles for the subsequent explorations in the poem. Less successful is “Destiny,” opening with “The end of desire is the culmination of want” and never quite pulling free of abstractions. The poem “Rosary” integrates concrete imagery with the psychological aspect of memory more successfully as the two are woven together in lines such as, “but no sins invaded your tiny house/amid cloudy weather or hidden gnomes.” “Pyramid,” on the other hand, reads more like a short, short story than as poetry, suffering from a too-straightforward accounting of events. agape at his own awakening. but I chalk it up to European efficiency. Any visitor’s view of Prague (or any location) is colored by that person’s own history and intentions in being there. Robert Prochaska isn’t quite in the present, so we aren’t reading an account of the city as much as seeing it as the backdrop to the search for history. This search concludes with the nine-part poem which ends the collection, “Restoration of the Lost Suitcase,” which moves from section to section as a movie might shift from frame to frame, thoughtfully and blending visuals with personal philosophy. the gilded edges to glisten in the air. there are many stones that build a foundation. Engaging the senses generally serves the author well in the book as a whole; passages such as these last quoted come too close to commentary and slow the work to a gentle trot rather than a gallop. The majesty of the horse can quickly vanish in an instant, as what happens much with human life. 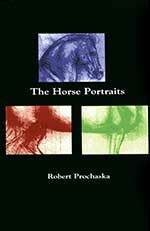 The Horse Portraits is a collection of poetry from Robert Prochaska that touches on the quickness of the beauty of the world to decay and shows its uglier face to us all. Honest poetry with a clear message, The Horse Portraits is a riveting read, highly recommended.